Important early Civil War Map illustrating the first major Union victory on the Mississippi River at New Madrid or the Kentucky Bend. 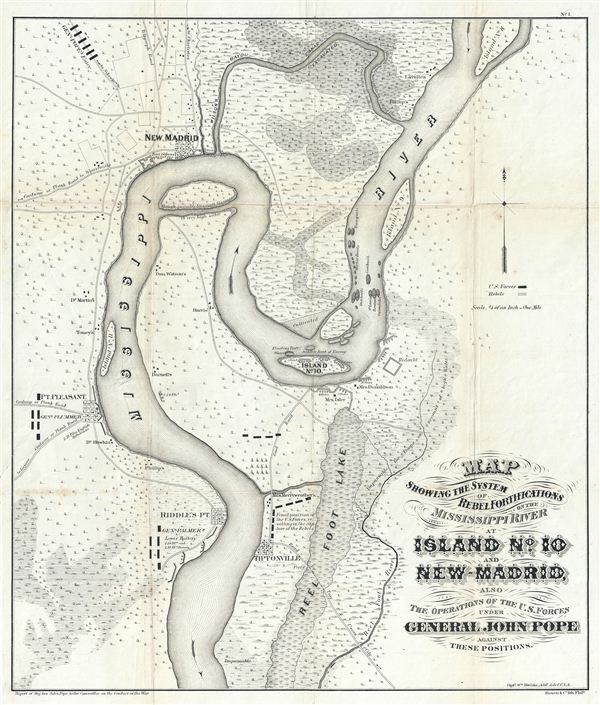 Map showing the system of rebel fortifications on the Mississippi River at Island No. 10 and New Madrid, also the operations of the U.S. forces under General John Pope against these positions. A scarce and important 1862 Civil War map illustrating the course of the Mississippi River in the vicinity of New Madrid, Point Pleasant, Riddles Point, and Tiptonville. This region, collectively known as the Kentucky Bend, is situated at the meeting point of Missouri, Kentucky, and Tennessee. The map was prepared by Major General John Pope, a Union Commander, to illustrate he decisive siege and take over the strategically situated and heavily fortified Island No. 10. Located just up river from New Madrid, Island No. 10 is situated at a sharp northward curve in the Mississippi. The Confederate Army fortified the island realizing that, if they could control Island No. 10, they could effectively prevent Union forces from using the Mississippi as gateway to the Deep South. General John Pope was the commander of Union Forces in the region. As former surveyor and member of the Army Corps of engineers, Pope came up with an unusual solution. While distracting the Confederate Army with his troops positioned around Point Pleasant, he sent another part of his army northward to New Madrid, which the Confederacy had recently abandoned in favor of the more defensible position at Island No. 10. He had the New Madrid contingent of his forces excavate a wide canal through the Bayous east of New Madrid to reconnect with the Mississippi between Island Nos. 8 and 9. By passing transports and gunboats through the canal, Pope not only limited the strategic importance of Island No. 10, but also positioned troops on both the Missouri and Kentucky side of the river, thus surrounding the island and effectively cutting off its single supply line. The Confederate forces, outnumbered and surrounded, surrendered their position on Island No. 10 on April 8, 1862. The Union victory at Island No. 10 marked the first time the Confederate army lost a defensive position on the Mississippi River. It opened the Mississippi to navigation by the Union Navy nearly as far as Memphis and marked a major turning point in the Mississippi theater. When Admiral Farragut sized control of the Confederate city of New Orleans only three weeks later, the Confederacy found itself nearly cut in half by its most important artery - the Mississippi River. This map was laid down by, William Hoelcke, a Union Officer and Chief engineer of the Department of the Missouri, on the instruction of the victorious Union commander, Major General John Pope. The map is derived from various sources, including Coast Survey preliminary studies, original survey work commanded by Pope, and earlier street plans of New Madrid, Point Pleasant, Riddles Point and Tiptonville. This map was published for the Report of Major General John Pope to the Committee on the Conduct of the War. It is considered a cardinal piece for collections focused on the early days of the American Civil War and the Mississippi River theater. The present example is identifiable as an exceptionally early edition by the use of the term 'Rebel' in the title, as subsequent editions substituted the term 'Confederate.' Later variants of this map appear in several subsequent publications, including the Civil War Atlas. John Pope (March 16, 1822 - September 23, 1892) was an American military officer active in the middle part of the 19th century. Pope was born in Louisville Kentucky to a prominent family with close ties to future president Abraham Lincoln. He graded from West Point in 1842 and served in the Mexican American War before being appointed to the Army Bureau of Topographical Engineers. He served briefly under explorer John C. Fremont, but the two never really got along. During the American Civil War, Pope, now a Major General successfully led several campaigns in the Western Theater, including the strategic capture of the fortified Mississippi River Island No. 10, near New Madrid, Missouri. He was subsequently reassigned to the Eastern Front where he was less successful ultimately suffering a disastrous defeat in the Second Battle of Bull Run. Following the Civil War, Pope served briefly as Reconstruction Governor of the Third Military District (Georgia, Florida, and Alabama) and was eventually sent west for the Apache Wars. Despite having a brash argumentative manner, he argued for humane treatment of Native Americans and campaigned against the activities of the corrupt Indian Bureau. Pope retired in 1886 and died at the Ohio Soldiers Home in Sandusky, Ohio. Pope, J., Report of Maj. Gen. John Pope to the Committee on the Conduct of the War, (Washington D. C.: War Department) 1862. Very good. Minor wear along original folds. Blank on verso. Professionally flattened and backed with Japanese tissue. Rumsey 1780.010 (1895 edition woth additional panels), Library of Congress Catalog no. 99447443. Stephenson, R.W., Civil War Maps: An Annotated List of maps and Atlases in the Library of Congress, 299.8.